By Gabriel CanadaI had high hopes that such terrible inaccuracies wouldn’t be repeated three decades later when Universal Studios took on the retelling of Dillinger’s life for Public Enemies (2009). From the start, historical accuracy was respected with director Michael Mann shooting on location at the banks, hotels, prisons, and hideouts where the real events took place–even going so far as to have his set designer restore many of them, creating tourist havens for local communities. The actors and film makers even descended on the Dillinger family farm. Which is baffling. Michael Mann, the director of Public Enemies, was also the director of Last of the Mohicans and Heat. He played a large part in launching the careers of actors of color like Wes Studi and Eric Schweig in the 1990s. Though Mann keeps the context of Billie’s heritage intact in the film, and has a history of working with First Nation actors, we are left with Cotillard–who, like Phillips before her, is far removed from the Wisconsin reservation where Frechette lived most of her life. The only way to let the audience know Cotillard is playing an Indian is for the actors to come straight out and say it, as if denied the use of a buckskin dress, Hollywood simply didn’t know how to introduce an audience to a First Nations woman in a speakeasy. Billie Frechette is the sole heroine in these Dillinger films, where tough guy gangsters are mowed down in hails of bullets and G-men don’t bother to flash their badges before opening fire. Yet, the first thing the film makers want the audience to know is that she is half Indian. It makes me wonder: If that detail about her is so important, why was this overlooked by the casting directors? 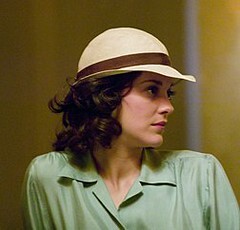 We are meant to feel sympathetic for Billie in Public Enemies and Dillinger. Not much good happens to her. She goes to jail and is tortured by the FBI for little more than falling in love with the wrong guy. The films take pains to suggest she was with that wrong guy because no one wanted to dance or drink with an Indian. Well, if anyone is responsible for that last plight of Billie onscreen, it is Hollywood itself. Crime may not pay, but Hollywood–for whatever reason–still thinks racebending will.Comment: For more on Public Enemies, see Cotillard's Discovery of the Menominee and (Mis)casting in Public Enemies.